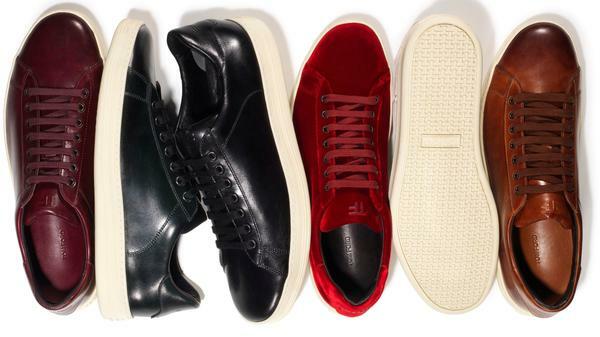 Tom Ford is launching fancy schmancy sneakers for Fall 2014 – sign me up! Sending a message that the current sporting line obsession of the fashion industry is still going strong. Prices range from $690 to $990, for sneaks that have been hand made in Italian workshops, where the leather is hand polished for three days for the deep patina. If cost is a concern for these norm core creations, go for the velvet low tops with the modest $690 price tag. reversecommuter LOVES all things Tom Ford (click here to revisit the love), and wonders when the women’s sneaks will be unveiled…and for how much. DIOR Secret Garden Part 3 has returned to the intoxicatingly beautiful Palais de Versailles. I love these videos, shot by wonder duo Inez and Vinoodh. If possible drink pink bubbles while wearing pink at some point this weekend – it’s good to have goals! This entry was posted in accessories, Architecture, Art, Boston fashion, Boston suburb fashion, children, Fall Fashion Trends, Fashion, Finance, Footwear Trends, Magazines, makeup, Media, mens fashion, mommy fashion, Shoes, Shopping, Sports, Spring Fashion Trends, suburbs, Technology, Travel, Trending, Trends, Uncategorized and tagged Boston, boston fashion blog, Boston fashion blogger, Dior, Fall 2014, Fashion & Finance Friday, France, Inez and Vinoodh, Instagram, LA Times, Lucky, luxe sneakers, mommy blogger, mommy fashion blog, mommy fashion blogger, normcore, Palais de Versailles, Paris, Patch.com, Secret Garden 3, suburban fashion blog, suburban fashion blogger, Tom Ford, Versailles, youtube by reversecommuter. Bookmark the permalink. Consider your goals for me already achieved! Pink bubbles while wearing pink sparkles…DONE! The Tom Ford sneaks are to die for – I can’t get over the shine of the leather in a photo. The real deal must be beyond fabulous!